Today in Masonic History Daniel O'Connell passes away in 1847. Daniel O'Connell was an Irish politician and political leader. O'Connell was born Carhan in County Kerry, Ireland on August 6th, 1775. His family was a once wealthy Roman Catholic family that had been dispossessed of it's lands. Under the patronage of his Uncle Maurice who had retained his wealth, O'Connell traveled to France for his education. He would also become familiar with the pro-democracy radicals of his time. In 1794, O'Connell was admitted to the bar in Lincoln's Inn, one of four governing legal institutions in England. In 1796, he was admitted to Dublin's Kings Inn which controls barristers in Ireland. In December of 1796, Wolfe Tone's French invasion fleet arrived in Ireland. Tone was inspired by the American and French Revolution and sought the end of monarchical rule of Ireland. O'Connell's uncle urged O'Connell not to get involved in the fight. Eventually to save face with his peers, O'Connell took a position with a the Lawyer's Artillery Corps. In 1798, O'Connell was called to the Irish Bar and became a barrister. That same year the United Irishmen, led by Tone, staged their rebellion and it was put down by the English military. O'Connell sought reform in Ireland through peaceful means and did not agree with the violence of the rebellion. Despite his objection to violence, O'Connell would defend many accused of political crimes, especially if he felt they were falsely accused. In 1811, O'Connell would form the Catholic board which campaigned for Catholic Emancipation, this would include the lifting of the ban at the time preventing Catholics from serving in Parliament. The organization was considered a subversive organization and many of it's members were in danger of prosecution under the 18th century statute. In 1815, as part of his work with he Catholic board, O'Connell had a life changing experience. He was challenged to a duel by noted duelist John D'Esterre. The subject of the duel was O'Connell's comments that the Dublin Corporation, a stronghold of Protestant Ascendancy, was nothing more than a "beggarly corporation". O'Connell refused to apologize and the duel was set. A huge crowd turned out to see the duel, many hoping to see O'Connell's death, as he had become viewed as a public nuisance. O'Connell was victorious in the duel and that would weigh on him for the rest of his life. He was horrified to have taken a life and offered to aid his widow financially, as she was left destitute. The widow declined, although eventually she would agree to an allowance for her daughter, which O'Connell paid for the rest of his life. In 1828, O'Connell stood for a seat in the House of Commons. He would win the seat, although at that time all members of parliament were required to take the Oath of Supremacy, which declared the King to be final decision maker in all things earthly and spiritual, which was in conflict with O'Connell's beliefs as a Catholic. It was decided to allow O'Connell to take his seat to avoid another uprising in Ireland. In 1829, the Prime Minister convinced George IV that Catholic emancipation was the right thing to do and it became law. Unfortunately for O'Connell it was not retroactive and an English Catholic became the first Catholic to serve in Parliament. The Catholic Emancipation would lead to the Jewish Emancipation in England, allowing Jewish members of parliament to omit the portion of the Oath of Allegiance that refers to Christianity. King George IV once complained that "Wellington is the King of England, O'Connell is the King of Ireland and I am only the Dean of Windsor". The regal jest was meant to express his general admiration for O'Connell during the height of his career. After Catholic Emancipation, O'Connell would spend the rest of his life trying to repeal the Act of Union which created the United Kingdom of Great Britain and Ireland. The Act of Union has been repealed in Ireland, although not in Great Britain. 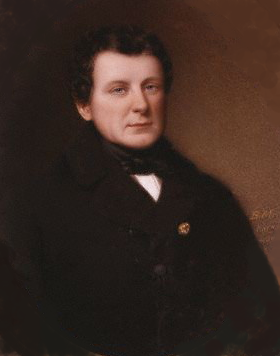 In 1841, O'Connell would become the first Catholic mayor of Dublin since the reign of James II the last Catholic Monarch of England, Scotland and Ireland. O'Connell would pass away in Genoa, Italy on May 15th, 1847 due to a softening of the brain (cerebral softening). O'Connell is known as the The Liberator or The Emancipator. O'Connell was a member of Masonic Lodge No. 189 in Dublin. He was Initiated in 1799. In 1837, he would publish a letter in the newspaper regarding his membership in the fraternity. This would lead to him being "excluded", but not expelled, from all rights of Freemasonry.